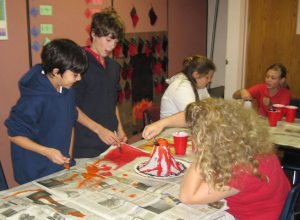 Freedom Academy offers several ways for you to be involved with your child's education. Volunteers are a vital part of our school program. They can assist in reducing the adult-to-student ratio and make an individualized program more effective. We hope many of you can participate in this rewarding experience. Volunteers who wish to work with students will be required to obtain a valid fingerprint clearance card from DPS. Volunteers are used at the discretion of the teacher. Each teacher will have a system in place of how to best utilize their volunteers. Please respect the boundaries they put into place and offer your services as they are needed. If you would like to volunteer to help in your child’s classroom, you will need to contact your child’s teacher in advance. Parents who are volunteering on campus or on field trips must follow the dress code of modesty. The policy stated for free dress for children is the model for parents who are on campus. Parents who are dressed inappropriately on campus will be asked to review the policy and dress accordingly. To help parents that would like to carpool to school with other parents from their area, Freedom Academy is recommending the GoKid carpool app. The GoKid app works on both iPhones and Android (Google) phones, and can be downloaded from https://www.gokid.mobi. You can also use the app to create carpools for sports and other activities. The app offers route optimization and automated reminders. Below you will find more detailed information about our policies and procedures, links to online resources, and downloadable forms. Be sure to click each tab to see the resources available. Click the links below to download our forms and policies. If you have an account, please login. If you don't have an account, click the link Create an Account. Once you have logged in, click Add to add the name of your child. Enter the first name and last name of your child, and select Freedom Academy as the school. Absences must be called in by 9:00 a.m. on the day of the absence to be considered EXCUSED for illness, family emergency or death in family. Personal days need to be called in but are still considered UNEXCUSED. Work turned in from an unexcused absence day will receive ZERO credit. All family vacations should be scheduled during scheduled school breaks. Absences due to vacation will be considered as unexcused. Teachers will not provide homework and/or class work for unexcused absences. Special considerations will be made for absences due to bereavement. An absence on the due date of a major assignment (essay, lab report, project, etc.) may not extend past the due date of that assignment. If a student is not in school on the due date of that project, it is the student’s responsibility to make sure the assignment is turned in on or before the said due date. The student should expect to submit the work and/or makeup the exam on the day of his/her return. Likewise, absences during the preparation time of a major assignment may not extend the due date. For more details about our attendance policy, please review our Parent/Student Handbook. All uniform bottoms must be navy blue or khaki and must be from a verified uniform vendor or uniform section of a department store. (Verification of uniform brand will be required at the discretion of administration.) All bottoms must have a regular fitted waistline and no low cut shorts/pants, skinny pants or elastic band ankle pants will be allowed. Bottoms must be loose fit (no stretchy or spandex allowed in the fabric)leg and shorts come to the top of the knee. Pants that are too tight will be considered a dress code violation. Cargo shorts/pants are allowed. Girls will be permitted to wear Skirts/Skorts and Jumpers in navy blue or khaki or the red/blue plaid . All skirts/skorts/jumpers must be worn with a snug fitting bike type short underneath. Skorts and shorts must be worn to the knee. All uniform shirts must be purchased from the Freedom Academy school office. Shirt length must come 2 inches below the hipsocket. Layering is acceptable; however, all layering must be uniform colors. For more information, please see the official Uniform Policy. See the list of questions and answers below for help with our online systems. How do I get a ParentVUE account? Once your student is enrolled and entered into our student information system, Synergy, our office staff will print out an activation key letter with instructions on how to create your personalized account. The letter will be given to you either at the beginning of school at Parents' Night, or you may request a copy at the front office. I have a letter with an activation key, but how do I login to ParentVUE? Click I have an activation key and need to create my account. Read our Privacy Statement, and then click I Accept. Enter your First and Last Name, and Activation Key EXACTLY as they are spelled on your activation key letter. Your name must match as well as your activation key. Enter your desired username and password (at least 6 characters). Also enter your primary email address - this will be used for school mailings. REMEMBER these selections as you will need them to logon the next time. I forgot my ParentVUE username or password. How do I reset it? Underneath the Username and Password boxes, click on the Forgot your password? Click here link. Enter your email address (the one you added when you signed up for ParentVUE) and click the Send Email button. You should see a Email Sent message. Click on the link to return to the login page. Check your email. You should received an email with your username and password. Don't forget to check your spam folder, just in case! If you are still having problem, please come in to our front office and we can assist you. We cannot give username and password information out over the phone for security reasons. Can I access ParentVUE on my phone? Yes, you can access ParentVUE using either an iPhone or any Android/Google phone like Samsung. First, you must create your account using your activation key using a web browser on a computer or on your phone. See the instructions above. After that, install the ParentVUE app. The app is available from either the iTunes Store or Google Play (depending on the type of phone you have). Download it just like any other app you have. The app is free, and can be found by searching for ParentVUE in the store. Once the app is installed, you can swipe left and allow your phone to search for the school. This works best when you are near the school. Otherwise, tap Enter Manually in the bottom corner of the screen and enter https://parentvue.freedom-academy.com as the website address. Enter your username and password and click Login. How do I pay for my child's lunches online? How can I pay for my child's extracurricular fees for field trips or sports? Go to the EasyPay page above on our website. You can pay for all donations and fees online! If you prefer, you can also come into our front office and we can assist you.